FORESTI DE BERGAMO, Jacobus Philippus. Brescia, Boninus de Boninis, 1. XII. 1485. Small folio (21 x 31 cm). Double rules along inner margins of text and between table columns, rubricated throughout. 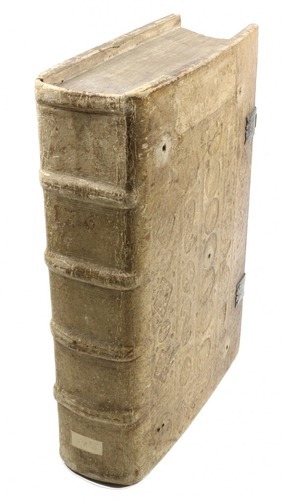 Contemporary richly blind-tooled vellum over wooden boards, bound in the monastic shop of the Würzburg Benedictines, two clasps. 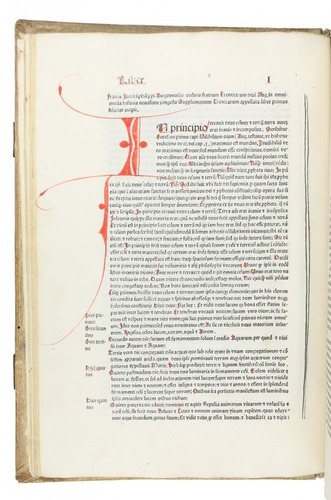 Early edition of a popular world chronicle by an Augustinian cleric, a fine copy in a monastic binding. In his chronicle Foresti proposed to bring together the most important historical facts from each year, starting with Genesis. Although he often placed legend and myth on the same plane as documented history, Foresti's chronicle was the first world history to include short bio-bibliographies of Arab scholars. These were not taken over from any of the principal sources cited by the author (Vincent of Beauvais, Boccaccio, Platina, and St Anthony of Florence), attesting to the breadth of his scholarship (cf. Hasse, Success and Suppression: Arabic Sciences and Philosophy in the Renaissance , p. 32). Beautifully printed, this edition contains numerous aids to the reader, presumably at least in part as instructed by the author. Two tables in quire aa comprise an alphabetical index of passages mentioning famous women and an alphabetical index to cities named in the text. 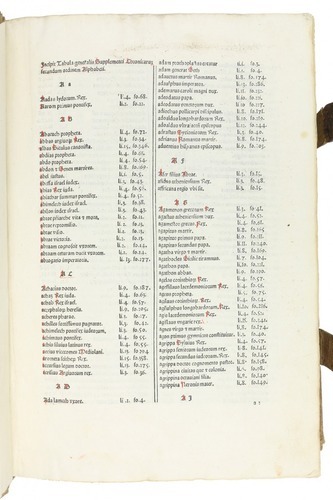 A double-rule chronological bar runs along every page, separating two calendars: on either side of the bar is printed, at the head of each annual section, the date since Creation and the Christian year. Finally, the quire register on the last leaf summarizes the contents of each gathering. Provenance: Würzburg, Benedictines of St. Stephen (contemporary inscription on front pastedown, "Iste liber pertinet ad S. Stephanum In herbipoli"; a few contemporary marginalia, mainly single words in books 2, 9 and 13). Latterly in the collection of the Aschaffenburg scholar and bookseller Bernd Pattloch (1940-2014) with his bookplate. BMC VII, p. 969; Hain-Copinger 2806*; Goff J-209; USTC 994082; Walsh 3401; cf. Dizionario Bibliografico degli Italiani XLVIII, pp. 801-803.